Christopher Michael Bando was born February 4, 1956 in Cleveland, Ohio. The six foot catcher is the twelve year junior brother of early seventies Oakland A’s All Star & team Captain,Sal Bando. Chris attended Arizona State University & was a second round draft pick of the Cleveland Indians in 1978. After two minor league seasons he was batting .349 at AA Chattanooga in 1980. The following year he hit .306 & got promoted to the Indians squad at the end of the season. 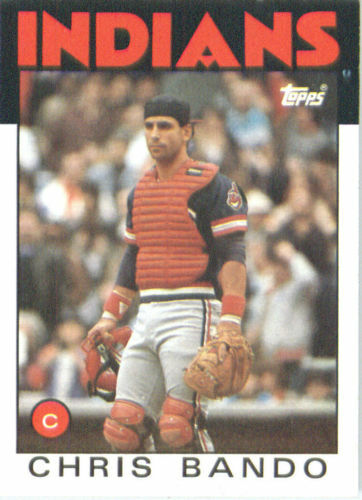 Bando was primarily a career backup catcher from 1981-1989 to guys like Ron Hassey, Jerry Willard & Andy Allanson. He enjoyed his best season in 1984 batting .291 with 12 HRs 11 doubles & 41 RBIs, while playing in 75 games. The next year he had 61 fewer at bats but dropped to a miserable .139 average. He saw the most action in 1987 as the team’s main catcher , behind the plate for 86 games. He hit just .218 & threw out 33% of would be base runners, posting a .988 fielding %. In August of 1988 he was released by Cleveland & got signed by the Detroit Tigers but only played one game for them at the end of the season. In 1989 he signed with the Oakland A's but played in just one game there as well, for the World Champion A’s before finishing his career. In nine seasons he batted .227 with 292 hits 27 HRs 46 doubles 2 triples & 142 RBIs, throwing out 34% of base stealers posting a .988 fielding %. 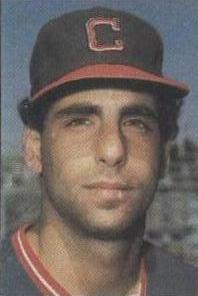 Retirement: After his playing days he became a Milwaukee Brewers coach from 1996-1998, while his older brother Sal was the team’s General Manager. In 2000 he was the Director of Coaching, Player Development, & Manager of the International Baseball League of Australia. Since that time, he has managed in the NY Penn. League with the Mahoning Valley Scrappers, scouted & served as a coach at Masters College.